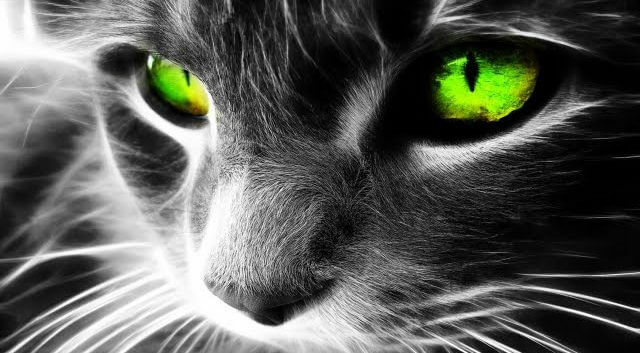 Cat – one of the most magical animals on earth! The aura of the cat is so big, that includes not only the individual, but also his family, home, and territory that the cat is committed to. Therefore, we must understand that when a cat rubs against your legs, it's not only that it's trying to get some food from you, but it also means that the cat is sharing its magic with you, its astral force. The one who pushes the cat away at this moment, saying “leave me alone, get out” simply blocks that positive energy the cat was trying to give him or her. Next time the cat won't share its astral force field with you, as a matter of fact, it may even take some of yours. Cats don't only protect the home from evil spirits entering it, but it also protects the house from negative energies that resided there before even the cat came to the house. This is especially useful if you move to a home that belonged to other people before, or a house where bad things happened. Also, cat's Purring may be a healing mechanism to offset long periods of rest and sleep that would otherwise contribute to a loss of bone density. The vibrations and contractions of a purr show a consistent pattern and frequency around 25 Hz; these frequencies have been shown to improve bone density and promote healing in animal models and humans. When a cat senses a spirit in the house, the first thing it does is following it around in order to figure out its intentions. To make sure that this astral entity won't threaten its territory, the cat is making every attempt possible to expel it through her energy field displacement. If that doesn't work, the cat traps the entity in its energy field and leads it out oh the house. Hence, in some traditions, there were motives when the evil spirit rides or flies on a cat. So, pay close attention to your cat and notice whether it keeps returning to a certain spot in the house, keeping a tense posture, and obviously staring at something. Such a behavior can be a sign of an evil presence. To help your animal to get rid of any evil spirits, read a prayer over the spot or do a cleansing ritual. If you don't know any prayers or rituals, you can simply burn some White Sage – it's a powerful way for getting read of negative or stale energy. The cat's astral field is so strong that it can easily chase any negative entity away. For this reason, people who communicate with spirits don't allow cats in the room where a seance is taking place. It can scare the astral beings. However, in some cases the presence of cats during magic rituals, is very encouraged. ussians used to have a very interesting ritual: when moving to a new place of residence they first let a cat in the house. If the house was old, the cat was taking care of all the unwanted negative energy – a remainder of the former owners. If the house was new, it demanded “a ransom,” which represents a powerful energy charge that a cat can give. A great use of cats' magical powers is found in healing. Cats of any breed and color have the ability to treatment and may inadvertently treat their masters, lying on their sore spots. One of the easiest methods of treatment with the help of a cat – a simple stroking her, release people from mental and emotional stress. In healing cats are used to improve vision too. To this end, some healers advise to pet tail white cat. Tortoiseshell: Women's magic, because this color pattern is inherited only by females. Children, pure magic, the giver of clairvoyance, healing.